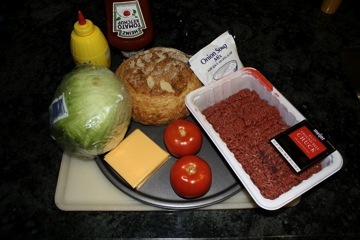 How to make a giant hamburger. 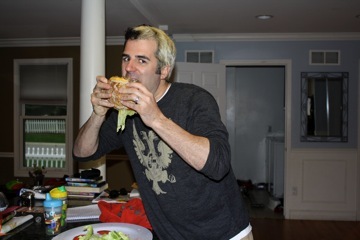 On this page I will construct a two and a half pound hamburger. 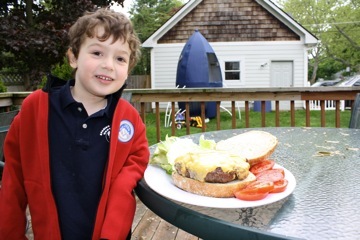 The only challenge to making a giant hamburger is flipping and moving the burger without it falling apart on you. I tried a number of techniques to solve this problem. I tried using different binding ingredients to hold it together and different techniques to flipping the burger. After some not-so-tasty burgers and quite a few patties that had to be put back together, I settled on my two-pizza-pan flipping technique. 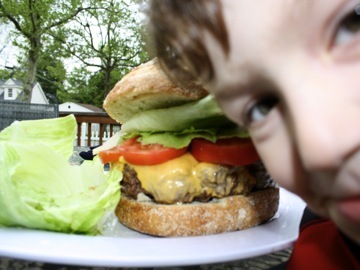 You can make a burger that is even larger with this same technique. I would guess you can make almost a ten pounder without any special tools. One challenge is finding a bun to put the burger in. 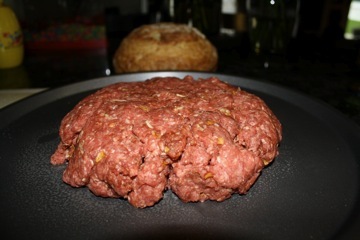 Finding a large, round loaf of bread is tough, so when I find the bread, I then decide upon the size of burger. My local super market makes a pretty good loaf of round bread for a great price. Our local bakery does to. Whole Foods makes an even larger one, but I can’t walk out of Whole Foods with a whole wallet left, so I tried to avoid that trip. Ketchup, mustard, A1, whatever you want on your burger. 1. Cut the bread in two, hamburger bun style. 2. 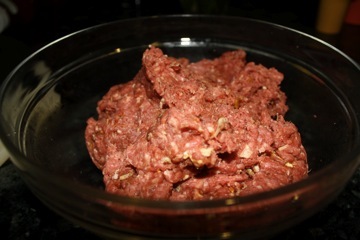 Mix the onion soup mix with the ground beef. 3. Spray one of the pizza pans with cooking spray, then form the ground beef into a patty on the pan. 4. 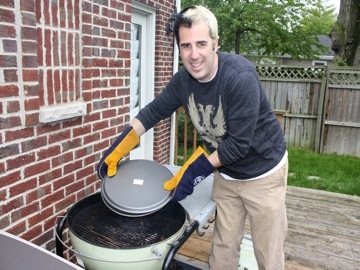 Fire up the grill and then place the pizza pan on top of it. You will be frying the burger on top of the pizza pan, your burger will end up like McDonalds instead of like burger king. 5. When your burger is half done, you are ready to flip. Here is how that is done. 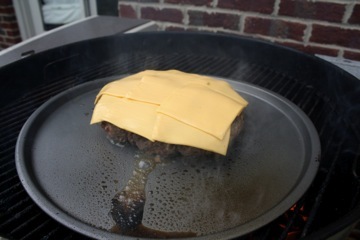 Spray the other pizza pan with cooking spray, then place it upside down on top of the burger. 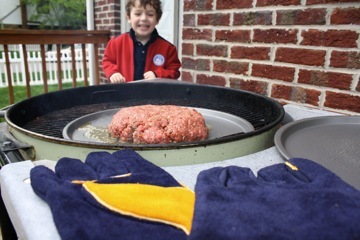 Put on your oven mits or welding gloves and then grab both pans (sandwiching your burger while you grab them) and flip them over. You can pause halfway to drain the fat off of your burger, but beware of flame-ups. Congrats. You have just flipped the big burger. Remove the top pizza pan. 6. Cook the burger on this side now until it is the proper doneness. 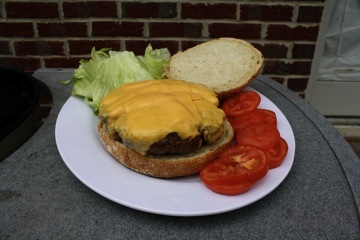 Thick burgers can take 10-15 minutes per side easily. 7. Melt the cheese on top, if you arrange the slices you can sort-of get it to melt into one giant piece of cheese. 8. 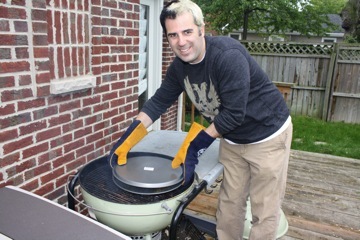 Remove the pizza pan and burger from the grill and let it rest for a minute. Drain the fat and then slide the burger onto your bun. 9. Apply condiments and then decide if you are going to share this with your friends or try to eat the entire thing yourself.